On Monday night, a crowd gathered outside the City Justice Center Monday night, protesters shouted "They think it's a game. They think it's a joke." 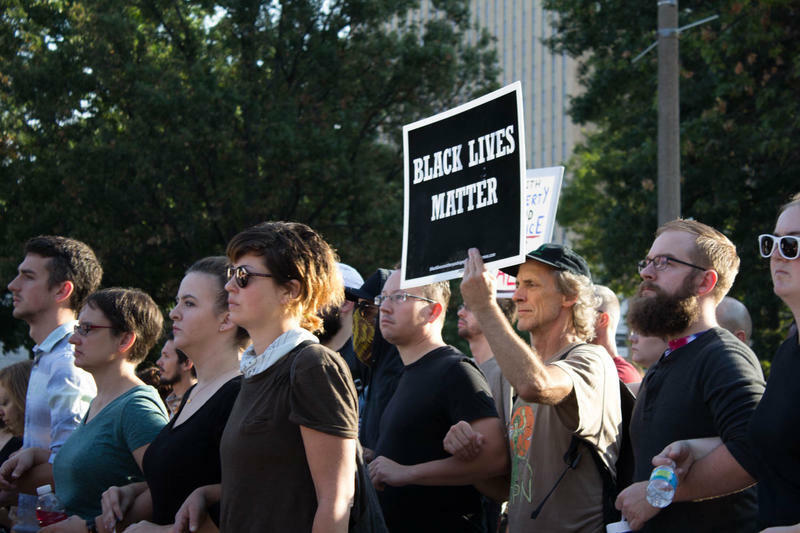 On Tuesday's St. Louis on the Air, contributing host Steve Potter was joined by St. Louis Public Radio Executive Editor Shula Neuman to discuss protests and response to the not-guilty verdict of Jason Stockley in the St. Louis region. 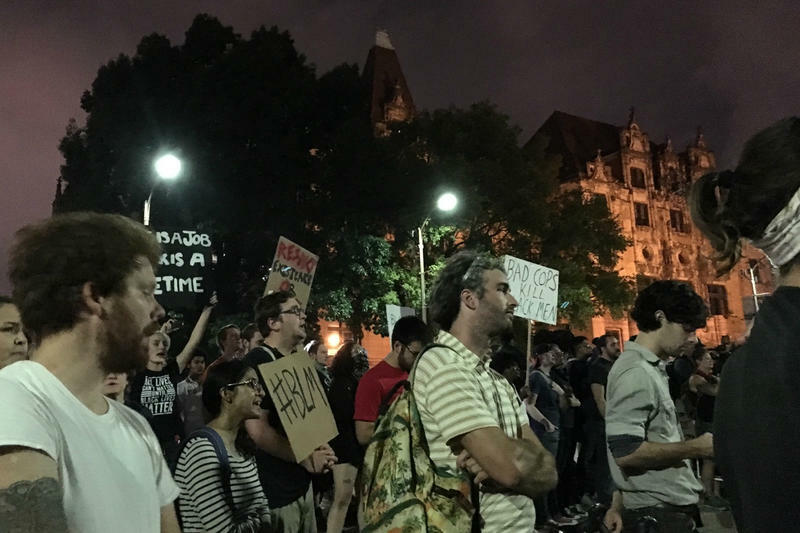 St. Louis on the Air contributing host Steve Potter and St. Louis Public Radio Executive Editor Shula Neuman discuss the past 24 hours of protests and hear listener comments about what the not-guilty verdict of Jason Stockley meant to them. Neuman said Tuesday was declared a "self-care day" by protest organizers, with no planned protests but for an afternoon interfaith prayer service in the works. She also discussed the past 24 hours of protest in the region, including that which took place on a rainy Monday night in front of St. Louis' Justice Center. On the program, we also heard from listeners who left voicemails about their reactions to the verdict. Some who had moved from the region said they did so because of the segregation and racism they experienced while living here. Another mentioned she felt "shame" at the news of verdict. We're still looking for your voices and perspectives. We're leaving our voicemail line open for the next few days. Give us a call, leave a message about what you're feeling after the verdict and days of protests, along with your first and last name and where you're calling from: 314-329-4937. We may use your comments on a coming program. On Monday’s St. Louis on the Air, host Don Marsh checked in with St. Louis Public Radio Executive Editor Shula Neuman and Reporter Ryan Delaney on protests around St. Louis in response to Friday’s not guilty verdict of Jason Stockley in the 2011 death of Anthony Lamar Smith. Later in the hour, he spoke with two representatives of the Ethical Society of Police, which strongly opposed the verdict. Programming note: St. Louis on the Air will return at 10 p.m. with a special live check-in with St. Louis Public Radio reporters and editors covering the community's response to the Stockley verdict. You can listen live and follow updates from our Twitter account at @STLonAir. The audio embedded below is from an earlier version of the program, which aired at 12 p.m.